Spending time in Europe, but on a tight budget? Here are three, FREE things to do that you can’t miss! Inside the gates of Buckingham Palace every day in the summer and every other day in the winter you can witness a typically British affair for absolutely free. 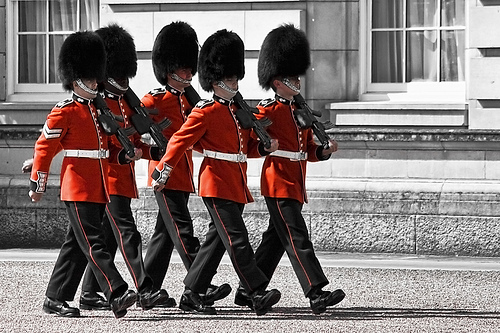 The London beefeaters with their red tunics, bearskin hats and impressively straight faces are a true London icon. The changing of the guards is a great way to watch them in action outside the beautiful setting of Buckingham Palace at 11:30 a.m. In amongst the extraordinary collection of Gaudi masterpieces characteristic of Barcelona, Parc Güell is free to enter and provides its visitors with a spectacular panoramic view of the city. Although involving a slight climb to reach, it is definitely worth a visit to appreciate some of Gaudi’s mosaic artwork and take in the city from a new perspective. As one of the most significant German landmarks in history, the remaining sections of the Berlin Wall make for a very interesting visit. The East Side Gallery is a section that has been transformed into the world’s largest open air gallery, exhibiting many paintings by international artists. During your trip to Berlin you might also want to watch your budget by staying in one of Oh-Berlin’s apartments – always an economic accommodation option!